A handful of Farragut High School swim & dive team members display their Knox-area Interscholastic Swim League third-place trophy earned after the competition Sunday night, Jan. 27, at UT’s Allen Jones Aquatic Center. 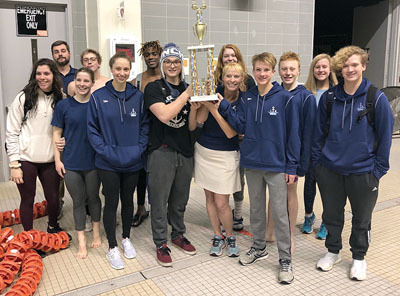 Farragut High School swim & dive team finished third among 25 schools at 2019 Knox-area Interscholastic Swim League “City Meet” Championships at University of Tennessee’s Allan Jones Aquatic Center Sunday, Jan. 27 — its highest finish since 2015. The team, which FHS sponsors said has “has gone through a major overhaul this year,” finished its 2018-2019 season with a dual-meet record of 6-1. Top Farragut finishers at the City Meet were led by 500-meter freestyle champ Jake Mason. Other top swim finishers: 200-meter free, Melanie Moczadlo, second; 200-free, Jake Mason, fourth; 200-IM, Kemya Kohinata, fourth; 50-free, Mara Spadafora, fourth; 50-free, Shaquille Howell, eighth; 100-butterfly, Melanie Moczadlo, second; 100-fly, Sarah Walker, sixth; 100-fly, Kenya Kohinata, sixth; 500-free, Chase Lahr, third; and 100-breastroke, Julia Nosarzewski, third. Diving: girls- Haley Whitt, tied for fourth; boys- John Murtha, eighth. Top relay finishes: girls 200-free relay of Spadafora, Walker, Moye and Moczadlo, third; girls 400-free relay of Lahr, Moye, Spadaforam and Moczadlo, third; and boys 400-free relay of Howell, Mason, Kohinata and Nosarzewski, fourth. The FHS team has qualified 20 of its 49 team members for TISCA State Meet, to be held in Nashville at Tracy Caulkins Aquatic Center Saturday and Sunday, Feb 8-9. “This is the largest team FHS has taken to state in years,” a team press release stated.